When I am having anything larger than the mailbox in my apartment building shipped to me I specify that I need to have it shipped to my job because it is a pain to walk over to the local post office and pick up a package seeing as the hours that I work tend to overlap with the hours that the post office is open. 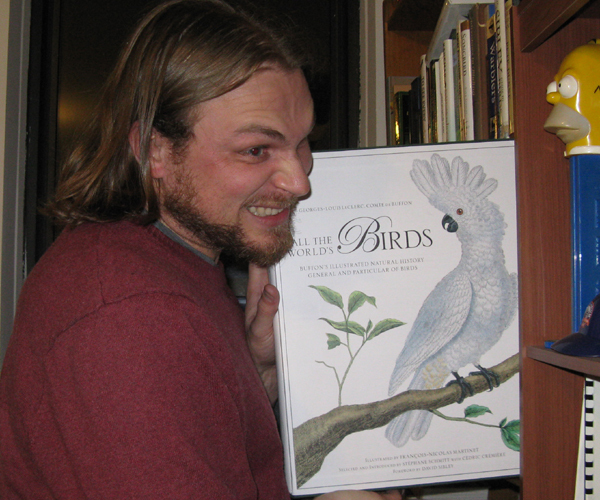 On the day that All the World’s Birds: Buffon’s Illustrated Natural History General and Particular of Birds arrived my coworkers crowded around to see what had so staggered our office mail guy. They were amazed by the sheer size of the book, and when I opened it up and paged through it they were astounded. A twenty-pound book is almost unavoidably impressive, but this book impresses by more than sheer size: it is beautiful! Once I got it home (after lugging it through the subways) my plan was to put it on one of the over-sized bookshelves that my grandfather and I had built several years ago. It wouldn’t fit! No matter how hard I tried I could not get the darn book on the shelf! Essentially, the book it so large that it needs its own furniture. This is not too surprising in a world loaded with coffee table books but leaving this book on a coffee table would be an insult to the book and could quite possibly lead to a broken coffee table. No, this book needs a podium, or, if there were such a thing as a church of birding, a pulpit from which it could be read. You see, the first time I started reading through it I had the book on my lap. Bad move. Within half an hour my legs fell asleep! Since then, I only read the book when it is sitting on the kitchen table in front of me. And I like reading and just looking at this book an awful lot. But before I use this entire book review discussing the size of the book I feel I must turn to what, exactly, All the World’s Birds is and who, exactly, its author, George LeClerc, Comte de Buffon, was. According to Wikipedia, the Comte de Buffon was an aristocratic “French naturalist, mathematician, biologist, cosmologist and author”. He lived from 1707 until 1788 and, along the way, wrote Histoire naturelle, générale et particulière, of which thirty-six volumes were published before his death and eight more after he passed. All the World’s Birds takes its artwork from Planche enluminees de l’Histoire naturel of Oiseaux (Hand-colored Plates in the Natural History of Birds) and beautifully combines them into one volume, with the English translation taken from The Natural History of Birds, the nine-volume English edition published in 1793. Buffon is credited with recognizing that organisms have changed throughout history and that the earth is much older than the religious dogma of the time led most to believe. He did not manage to put together the theory of evolution but Darwin, in the foreward to the sixth edition of Origin of Species, said “the first author who in modern times has treated it [evolution] in a scientific spirit was Buffon”. Buffon was one of the most widely-read scientists of his time though some of his theories, like the idea that the New World’s nature was inferior to that of Eurasia, were just plain silly (though the theory greatly incensed Thomas Jefferson who sent a moose to Buffon in an attempt to refute him). But what about the book? This is a book review, right? Well, I have already extolled the beauty of the book, which, by the way, comes with a sturdy and handsome slipcase, but perhaps more detail is needed. There are 1,008 color illustrations from Buffon’s original work by François-Nicolas Martinet on the books 672 pages. The foreword was written by field guide author extraordinaire David Sibley and the selection of what is included (and the introduction) was done by Stéphane Schmitt with Cédric Crémière. The artwork, all photographed from unbound original plates that were hand colored, is sublime. 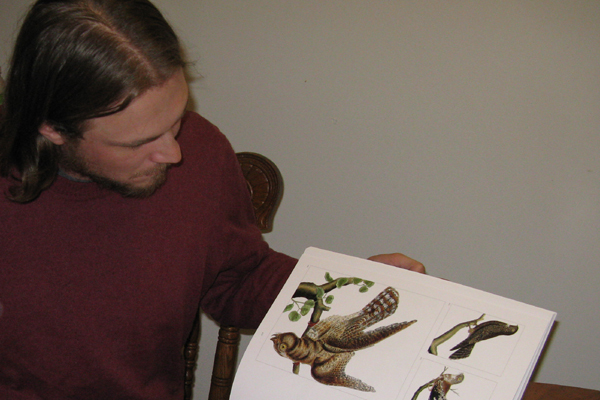 The sheer number of species represented is staggering, from the Bald Eagle to the Long-tailed Widowbird. Every effort as been made to identify the species pictured by their scientific name and common English names but some remain identified only by their genus. The images are amazing and only occasionally does one not look quite right, which should be attributed to Martinet often having to work from bird skins which do not always hold colors well (an example can be seen in the image of the Eastern Bluebird). One of my favorite aspects of the book is seeing the English translation of the French names that Buffon used for birds that are familiar to me. For example, Wilsonia citrina, the Hooded Warbler, was called “Gobe-mouche de la Louisiane” or the Lemon Flycatcher of Louisiana. Also, descriptions of species now extinct, like the Carolina Parakeet, are fascinating to one who has never seen them: “In autumn they resort to the orchard in great flocks, and as they tear and mangle fruits to obtain the kernel, which is the only part that they eat, they do much injury”. With a reputation like that it is not surprising that the birds were hunted to extinction. Corey, based on your expression in that first photo, I think you got a hernia. There’s a piece of library furniture known as a dictionary stand that you might want to invest in. Added bonus: the shelves underneath can be made into a nice sitting area for felines exhausted by reading.